Everyone in my family loves cheese. 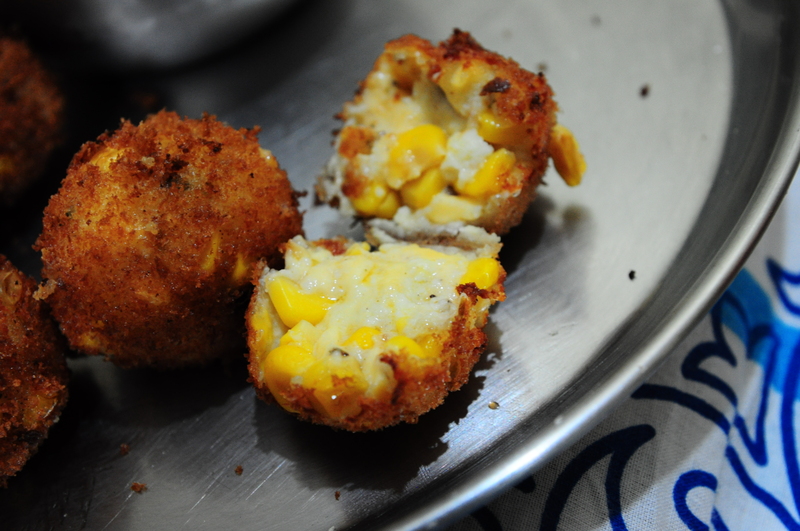 The jalapeno cheese poppers served at a local restaurant nearby is a hot favourite. I didn’t have any jalapeno peppers on hand today, so I tried to adapt that idea to a tin of American sweetcorn that I had in the fridge. The results were great and DH loved it 🙂 I paired it with a fresh tomato salsa dip which is quite refreshing and cuts the heaviness of the cheese and oil. Read on for the recipe ! 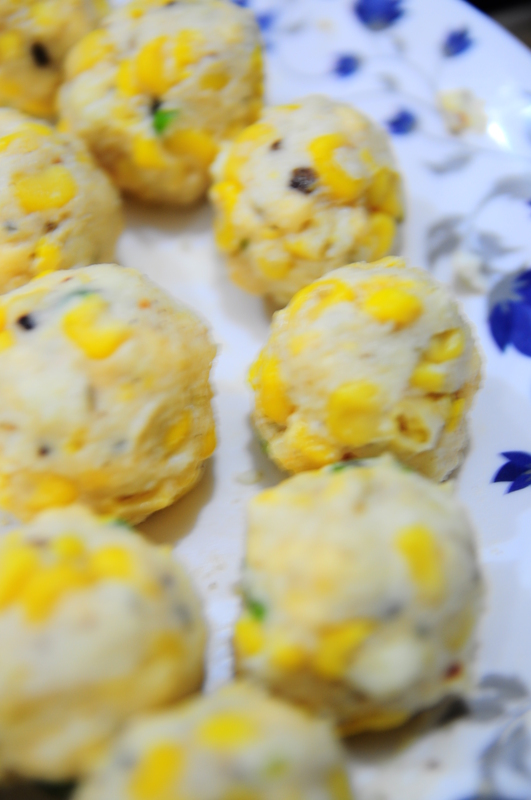 Drain the sweetcorn from tin and press nicely to get rid of excess water. Add this to the bowl with the paneer. Shred / grate the cheese slices and add to this. You can use any type of cheese you want. Add finely chopped coriander, pepper powder, chat masala, italian seasoning, lime juice, cornflour and salt. Mix this nicely by hand so that the mixture is firm and binds well. Check and adjust spices as per taste. Form this dough into small rounds and set aside in a plate. Refrigerate these for about 10 mins so that they are firm. This will help them retain their integrity and not break apart while frying. 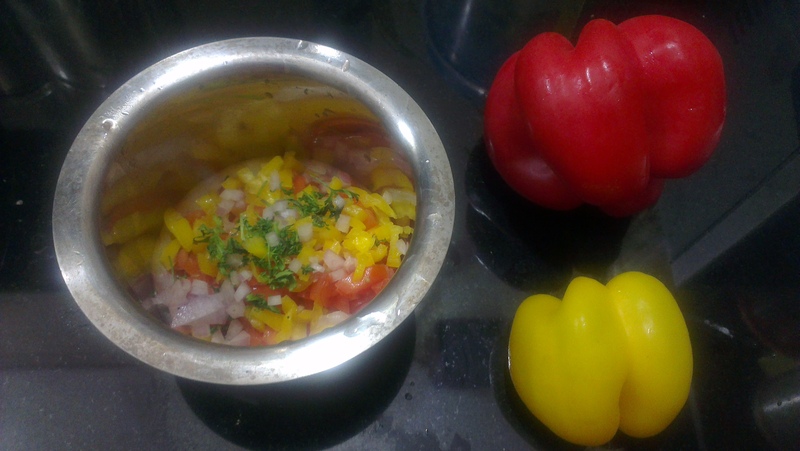 Add the chopped tomato, tomato ketchup, onion, bell pepper, lime juice, pepper powder, pinch of salt, sugar to a bowl. 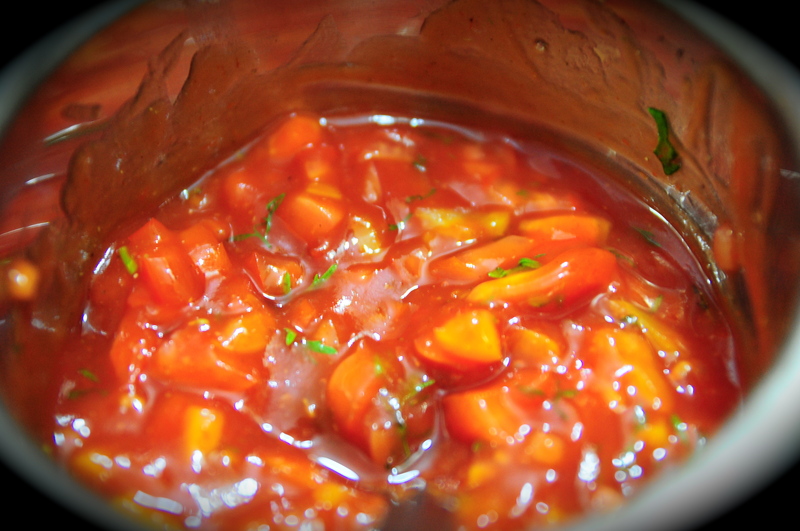 Mix well.Use a hand blender to blend this mixture depending on the consistency of the salsa you want. I like my salsa to be chunkier, so I just mixed everything with a spoon. Using a blender will give you a more sauce like consistency. Adjust the spices to suit your taste. Let it sit in the fridge while you do the frying. Pulse 3-4 bread slices in the mixer to get about a cup of breadcrumbs. Dilute about a tsp of cornflour in a very little water until you have a milk-like mixture. 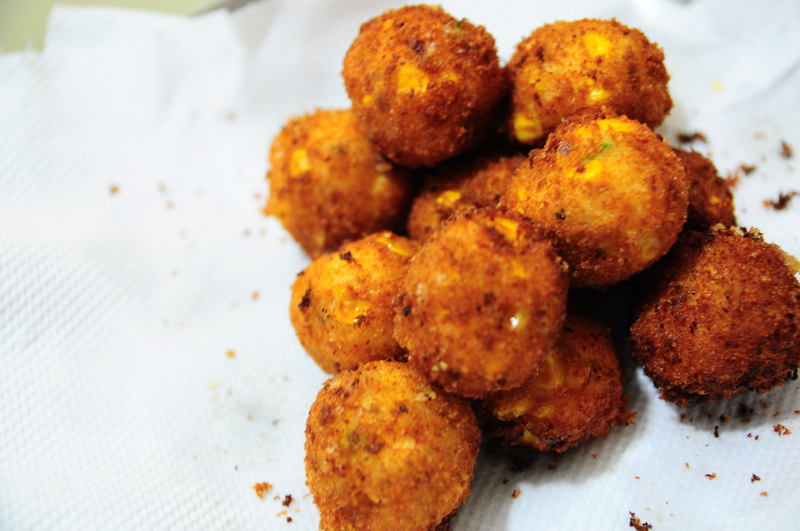 Get the corn cheese balls out of the refrigerator. 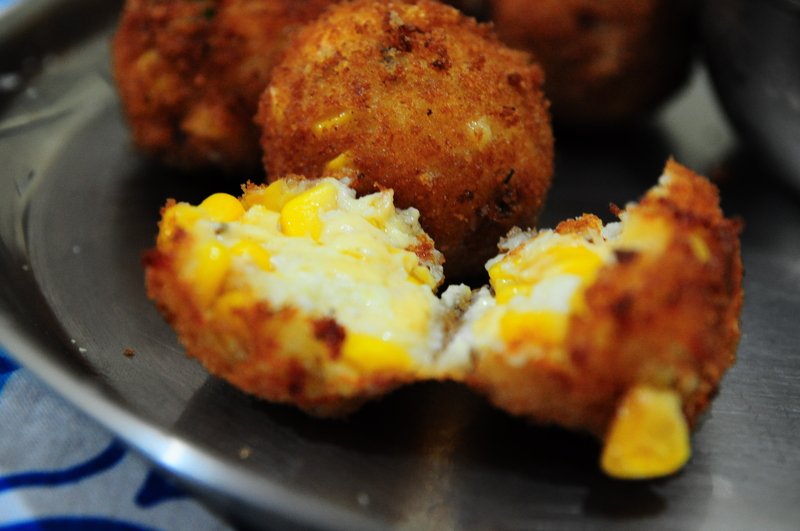 Now, coat them individually in the cornflour mixture and roll them over the breadcrumbs. This will help the breadcrumbs adhere well to the surface. Fry them in oil one by one until golden brown. These fry pretty quickly, so take care not to burn them. Transfer to a bowl/ plate lined with tissue to soak the excess oil. 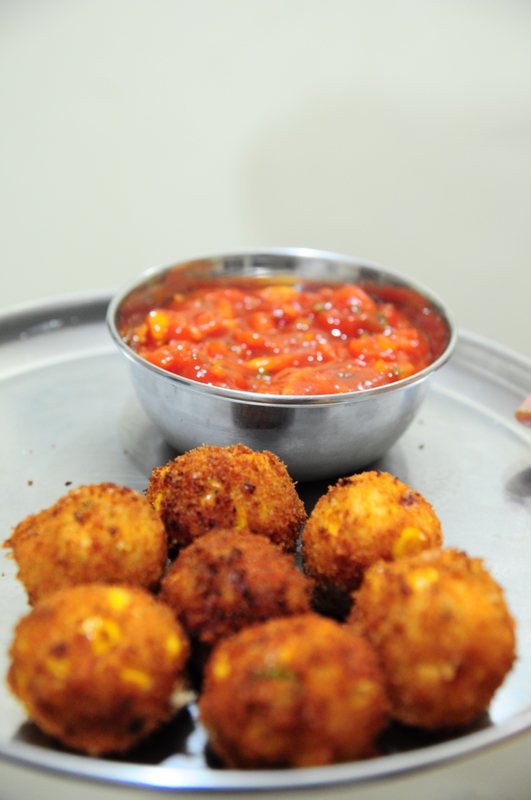 Serve hot with Tomato Salsa dip & dig in ! !